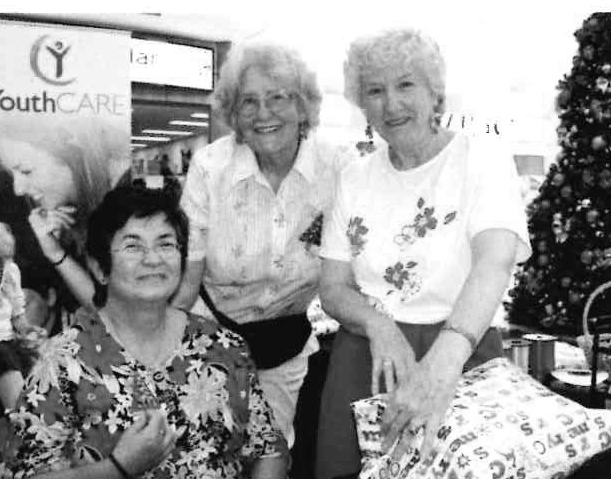 This top photo shows (from left to right) Libby D’Cruz, Judite Grenfeld and Diane Stephenson at Kingsway Shopping Centre in 2009. The ladies wrapped Christmas presents for a gold coin donation towards YouthCARE. Fast forward 10 years and the same three ladies are still wrapping gifts each Christmas season at Kingsway Shopping Centre! They’ve raised tens of thousands of dollars towards chaplaincy services in the Balga/Girrawheen area and in 2018 alone raised $3,314 through their Christmas wrapping. Libby, Judite and Diane have been fundraising for YouthCARE for over 17 years. They started by driving down to Jarradale weekly to pick apples, weigh and pack and then deliver them to schools and churches!